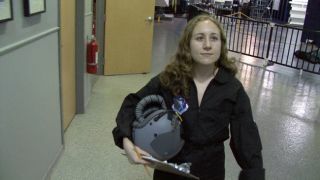 SPACE.com Senior Writer Clara Moskowitz carries an oxygen mask and helmet while preparing for hypobaric chamber training during a NASTAR training session for suborbital spaceflight. Last week, a private spaceship designed to take passengers forjoy rides in suborbital space made its first glide flight above California'sMojave Desert. The stage is set for space tourist flights as early as nextyear, but what will those intrepid space tourists feel during the flight? That's what I found out in a recent training session, andwow, was it a wild ride. As someone who's been to Space Camp and witnessed four spaceshuttle launches to date, I've long considered myself a space geek. But myspace cred was put to the test as never before when I took a stab at suborbitallaunch practice. This summer, I underwent a spaceflighttraining course culminating in a centrifuge ride that packed on a wallopingsix times the normal force of gravity. The run was meant to simulate a flighton Scaled Composites' SpaceShipOne suborbital spacecraft, the progenitor ofSpaceShipTwo, which was also designed by Scaled founder Burt Rutan. Virgin Galactic plans to launch people into suborbitalflights aboard SpaceShipTwovehicles as early as 2011. But space tourism is only part of the company'splan. Scientists hoping to conduct microgravity experiments arealso potential customers ? that's where the training course comes in. I was one of eight trainees at the three-day Suborbital ScientistTraining course at the NationalAerospace Training and Research Center in Southampton, Pa. I joined a group of researchers, including at least oneaspiring astronaut, who are working on experiments to take on commercialsuborbital space trips like the ones soon to be offered by Virgin, as wellas XCOR Aerospace, and Armadillo Aerospace. These experiments could range from studies on howweightlessness affects the human body to projects to observe how dust grainsinteract without the force of gravity. The $3,000 NASTAR training program, run by a Pennsylvaniacompany, Environmental Tectonics Corp., was designed to familiarize thescientists with the rigors of spaceflight to help prepare them and theirexperiments for the journey to space. Me, I was just along for the ride. When we arrived on site for ourfirst day, we donned NASTAR flight suits and settled in for some instruction bytrainer Glenn King on how altitude affects the human body. Commercial suborbitalspaceflights will fly to extreme heights ? high enough to reach space, but nothigh or fast enough to enter low-Earth orbit like NASA'sspace shuttles. At high altitudes, the atmospheric air pressure is lower than at sealevel, which can affect the body in myriad ways. To learn what it's like, wewent through a simulated flight to 18,000 feet (5,486 meters) using a hypobaricchamber, where the air was slowly sucked out of a closed room to recreate thelow pressure of attitude. I admit, my palms were a bit clammy going in. Specifically,it was this phrase in the training materials that gave me pause: "Thisaltitude is high enough that it will induce the onset of hypoxia, but not highenough that any serious injury should occur." Hypoxia occurs when the human body doesn't get enoughoxygen. We were on the lookout for symptoms such as blurred vision, loss ofcolor and peripheral vision, numbness and tingling, headache, dizziness,nausea, hot and cold flashes, and poor judgment and mental confusion. Clearly, this was going to be fun. Luckily, we were fitted with oxygen masks that reminded meof what Tom Cruise wears while flying jets in Top Gun. If we started to getsymptoms, we could take a hit of oxygen from the masks to perk us back up. As it turned out, we mostly faired fine. Sure, I felt alittle strange when we got to our peak altitude. And our collective performanceon a series of mental tasks showed we probably were not functioning at our best. For example, trainers passed around a child's puzzle ? aball with differently shaped holes that we had to fit corresponding blocksinto. For whatever reason, it seemed harder than it should havebeen! And I hold the simulated high altitude completely responsible for mysubpar performance on a set of math problems we completed on a worksheet whilein the chamber. Ultimately, I gave myself a pat on the back for enduring myfirst day of spaceflight training. I knew it was only uphill from there. Day Two began our introduction to NASTAR's centrifuge SpaceTraining Simulator, the STS-400 Phoenix. The machine has a 25-foot (7.6-meter)-long arm attached to agondola holding a cockpit simulator, where terrified volunteers like me can bestrapped in and spun. As the arm twirls around in a circle at greater and greaterspeeds, the rotation creates an outward-pointing force that multiplies theweight bearing down on the person in the cockpit. The orientation of thecockpit can be rotated so that the force is pointing from your head to yourtoes (the so-called Gz direction) or from your front to your back (the Gxdirection) ? or both. Yikes. I was almost shaking with fear when I strapped into the comfyseat in the cockpit and heard the loud click of the door locked behind me.King's calm voiced warned me the rotation was about to begin. I would like to state for the record that I did not lose mylunch on the centrifuge (even though I was reminded repeatedly there were bagsinside the cockpit in case I felt the need). The first day wasn't quite as badas my worst fears, but it wasn't as easy as any amusement park centrifuge I'veever been on either. It helped that they worked us up slowly. On that day eachtrainee went on a few rides where we felt Gs in each direction separately, in increasingamounts. The trainers ratcheted up the Gs we felt to 3.5 Gs in the Gzdirection, and 6 Gs in the Gx direction. When I got up to 6 Gs in the Gz direction (head to toes), itfelt like an elephant was sitting on top of me. At this force, breathing is difficult, as it takes aHerculean force just to push your chest out enough to take air into your lungs.I did put to use the pressure-breathing technique King taught us to help keepour lungs expanded and taking in air. And Gz, for me, was even worse. This force tends to pull theblood from the top of your body down into your extremities. So while my toesweren't starving for blood, my brain certainly was. King taught us to be on the lookout for loss of peripheralvision ? the so-called tunneling effect where your vision tends to go blackaround the edges and your field of view becomes smaller and smaller as yourbrain runs out of oxygen from lack of blood. Within seconds of packing on the Gz force, I experienced thebeginnings of this effect. As the centrifuge pummeled my body, I had to squeezemy muscles ? especially legs, feet and arms ? to constrict the veins andarteries there, forcing the blood out of my limbs and back to my head. This worked, surprisingly well, and I could quickly seeagain. Day Three brought my greatest test. Riding the centrifuge, I would undergo the full flightprofile of SpaceShipOne,the first privately funded reusable manned spacecraft that won the $10 millionAnsari X Prize in 2004. The ride was actually designed to simulate what passengersshould feel on Virgin Galactic's SpaceShipTwo suborbital flights, though datafrom that craft is not yet available, so NASTAR used readings from SpaceShipOneto design the centrifuge program. This ride would subject me to 3.5 Gs in both the Gx and Gzdirections during launch, then a period of simulated "weightlessness"(while it's really still 1 G because we're on the ground, in comparison italmost feels like microgravity), and then up to 6 Gx and 1.5 Gz during reentry. The G-forces build just like during a real flight, on thesame time scale. The experience is made even more lifelike by a seat thatshakes just like a real rocketship, and a domed display that shows a controlpanel and visuals simulating the forward and aft view at all times. I have to admit I was pretty much petrified. I watched my seven compatriots go before me. While it helpedthat they all appeared to have fun, I was sobered by the fact that even some ofthe most stalwart among them cried out in alarm when the spaceship dropped fromits carrier plane in mid-air and then the rocket engines ignited for a speedyclimb to space. First, we went through one flight where all the Gs were at only50 percent strength. That helped to prepare me for the full-on throttle, buteven the half-way version was intense. I knew a kick was coming when the rocketlit, yet still it caught me off guard. I screamed out loud like I was ridingthe upside-down portion of a roller coaster (which, by the way, I try to avoidat all costs). Frankly, after that it all felt bearable. Then I had a few minutes at rest before I took the full 100 percentG ride. If I thought the ascent was tough the first time, it was nothing to thereal thing. This time, it felt like what I imagine characters in sci-fimovies experience as they twist and whirl through a wormhole. My body was pulled with extreme force, and within seconds myperipheral vision started to black out. King's reassuring voice guiding methrough it reminded me to "squeeze, squeeze, squeeze" my leg and arm musclesto force blood back to my head. Luckily, it worked, and soon I was in "space." Ah, the relaxing release as the Gs lifted and I saw agorgeous view of glittering stars and shining Earth below. Yet I was stillfeeling apprehension for my return journey coming up in a couple of minutes. Soon, a disembodied female voice counted down the secondsand I braced myself for reentry. The Gs during this portion come in two waves ? a rapidincrease to 6 Gs pointing into my chest, which quickly let up, followed by amilder push to a little over 2 Gs. The z-direction Gs during this phase weremercifully low. If I make it sound agonizing ? well, that's not untrue. Butit was also one of the most thrilling sensations I've ever felt in my life. Andit was fascinating to learn about techniques to fight the G forces ? and seethat they really worked when I had trouble. Who knows? Those skills could come in handy when I take a realride to space!